Never can be too careful. That question is asked in commercials for a credit card company, which probably does not expect you to reply, “Bacteria.” The truth is, though, that it’s in there. Lots of it. 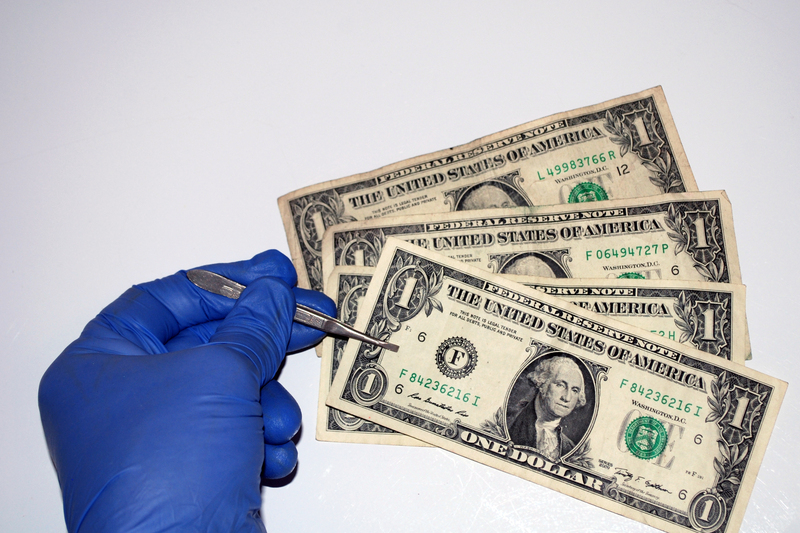 You may have heard urban legends that there are traces of illegal drugs on dollar bills, but scientific research over the past year or so isn’t finding nearly as much cocaine on our cash as microbes — most commonly the ones that cause acne. Others are linked to pneumonia, food poisoning, staph infections, flu and… well, you name it. What amazed me is that only about half of that DNA was human, presumably from people licking their fingers while counting cash. In addition to bacteria, there were viruses and fungi — OK, maybe you expect that. But DNA from horses and dogs? And don’t tell me it doesn’t surprise you that on dollar bills in New York City, they found small amounts of white rhino DNA. There are fewer than 20,000 white rhinos on our planet and as far as I know, only two of them live in New York, up at the Bronx Zoo. All right, so maybe a zookeeper petted one of the rhinos and didn’t wash his hands afterward. Then he bought a beer, tipped the bartender, who put the rhino’s DNA in his pocket at the end of his shift, and so on. The point is, money gets around, and since the cotton-linen blend on which U.S. currency is printed is somewhat absorbent, the germs go along for the ride. So far, the Dirty Money Project and similar studies elsewhere have only established that nasty stuff is definitely on money; scientists don’t yet know to what extent cash transactions cause outbreaks of disease, but it certainly seems plausible that there’s a connection, wouldn’t you think? So what can be done to avoid a dose of illness from handling dirty money? We could take a vow of poverty, I suppose, but there are other health risks associated with that approach. If microwaving kitchen sponges kills the bacteria they have absorbed, maybe it would work for cash, too. But until microwaves get so portable you can take them on the subway with you, that doesn’t seem very practical, either. Some countries — Canada and Australia among them — are now printing their currency on polymer film. But scientific studies have come up with conflicting results. One group of scientists found less bacteria on the plastic sheets; another study reported that microbes actually survive longer on them. In the meantime, the best approach is soap and water, administered frequently. When that’s not available, like after you’ve made a show of putting a dollar bill in the offering plate at church, a drop or two of hand sanitizer just might keep you from being the cause of an anthrax outbreak. This entry was posted in Science and tagged dollar bills, microbes on money, The Dirty Money Project. Bookmark the permalink. I look forward to microwaving sponges. I’m definitely guilty of spreading dog cooties. Clean on the rhino front, though.